National Association of Latino Independent Producers (NALIP) / VFT Member Scholarship will award two recipients a 2017 Media Summit Pass for a weekend full of insightful panels, workshops, screenings and more to be held June 22 - 25th at the Ray Dolby Ballroom at Hollywood and Highland. This year, HBO will be Presenting Sponsor for the event, bringing along remarkable industry leaders, executives and experts to fully engage and inspire content creators. David Levine, Co-Head of Drama for HBO Programming, will be Keynote speaker sharing his experience working on hit-series such as Westworld, Game of Thrones and True Blood. Gary Sinise is an American actor, director, and musician. Among other awards, he has won an Emmy Award, a Golden Globe Award, a star on Hollywood Walk of Fame and has been nominated for an Academy Award. A seminar about what a VO Talent should do in the booth. Each member will be given a script from a casting agent and record session in the booth. The day will be spent helping prepare for the US Vets 5K on Saturday, June 17th. Learn the real deal on what you really need to do to book a commercial. 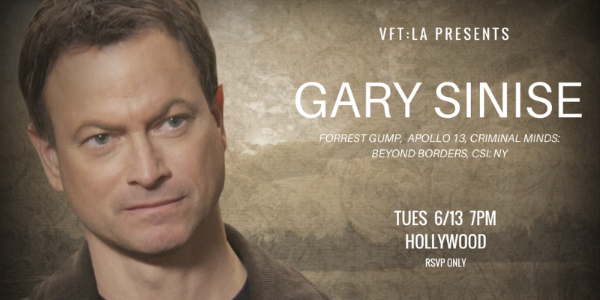 Session runner Mark Greene will give 20 VFT members the inside scoop from behind closed doors, take the actors through a casting session, and put together a panel of Commercial Casting Professionals to answer all their questions. Want to know how Studio Decisions are made? Speakers Series featuring Madelyn Hammond former Chief Marketing Officer for Variety and producer of the Deadline.com's Contenders events for Emmy's and Oscars presents roundtable "10 Suites. 10 Seats"
Writers Get Ready! The Third Exclusive VFT - Grindstone / Lionsgate Pitchfest is ON this Summer! Twelve VFTers will be selected to each pitch one of their completed screenplays to Grindstone / Lionsgate. VFT members only who have a completed, free-and-clear screenplay may apply. This means you own the rights to the story/script, have the rights to pitch, and there are no other legal attachments. No television or internet scripts allowed. No options on books, articles, or treatments will be considered. You may have a civilian co-writer or a veteran co-writer who is not part of VFT. Stay tuned for more details coming this summer! A competitive, elite studio / network internship program for veterans in college, or recently graduated, will launch this summer. This program made possible by a generous grant from Got Your Six and the support of our entertainment partners. 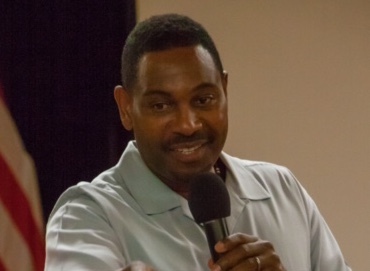 Article by Leo Sopicki and photos by Henry Thompson, Jr.
"God don't make no junk; none of you are accidents," was just one of many inspirational thoughts shared on life and acting by Mykelti Williamson at the May meeting of the LA chapter of Veterans in Film and Television (VFT). Williams shared his thoughts with vets and friends at the historic Hollywood American Legion Post. Williamson, known for his iconic role as Bubba Blue in Forrest Gump and currently featured on Designated Survival as Admiral Chernow, discussed his life and career with VFT - LA Director of Programs Jack Kennedy. Williamson shared how as a little kid he spent a lot of time watching reruns of Leave It To Beaver and mimicked what the Beav did. A lucky circumstance kept Williamson in the acting game. "When I was nine years old," he said, "a stage mom pulled her child out of a school play on Friday morning that was scheduled to go on Saturday. My mom volunteered me and I learned the lines overnight. After the play, I got a standing ovation." It was at that point Williamson knew he was an actor. Kennedy wondered if Williamson recalled when he felt he made it and was going to stick around in the acting business. "Your value comes from your family and your friends," Williamson said, "not from what Hollywood thinks of you. You never know when you are here to stay. Be humble." The interview paused as Williamson acknowledged the entry of producer/writer Graham Yost (The Americans, Speed, Broken Arrow). Yost and Williamson had worked together on Justified and Boomtown. The conversation turned to the importance of the script. "To me, the script is the star," Williamson said. Graham is one of the greatest writers of all time, so you don't want to change the script, you want to elevate it. He explained his approach to reading a script. "It's not a character that you are asked to play," Williamson said. "It's a human being. Be respectful." Kennedy brought up Williamson's theatrical experience. "I've done a lot of things in the theater," Williamson recalled. "It's the best training for an actor because you get immediate feedback. You sharpen your skills on the boards." Williamson then took questions from the VFT members in the audience. He was asked how to find representation. "The most important thing to remember," he said, "is that they will find you. I've talked to people at William Morris. They told me, "We don't groom people. We wait until they are ready and then we pick them off". "Just do your best work all the time". A VFT member asked how he wanted to be remembered. "I just want to know that I added value," he said. "Whatever I write in your heart, that's what I want you to remember." Williamson also spoke about the projects upon which he, his wife, and daughter were working. These included helping the homeless and making parents aware of the dangers of human trafficking. "If I haven't helped someone," he said, "then I haven't lived life. I've just walked through it." 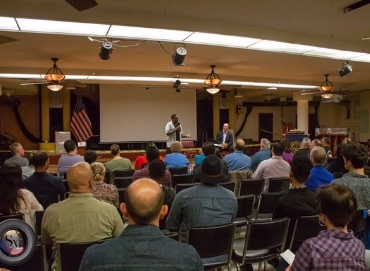 Before mingling with the VFT audience, Williamson promised to return and teach an acting class to VFT members. 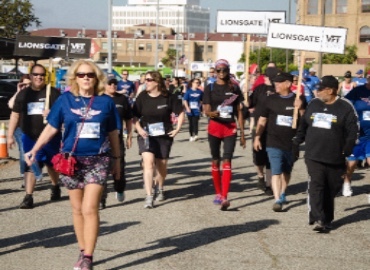 "As one of Lionsgate's newly formed Employee Resource Groups, Lionsgate Vets was thrilled to partner up with VFT on our kickoff event where we jointly participated in the New Directions for Veterans Memorial 5K. Not only was it a great way to help raise awareness and donations for homeless Veterans, but it was a pleasure and honor to be able to walk and run side by side with the heroes who have given so much for us and our Country," stated Ryan Black and Leon Pilosof, Co-Leads of Lionsgate Veterans. Nearly 30 VFT members participated in the event at the Los Angeles Veterans Affairs Medical Campus to honor those who have served, and made the ultimate sacrifice for our great nation. 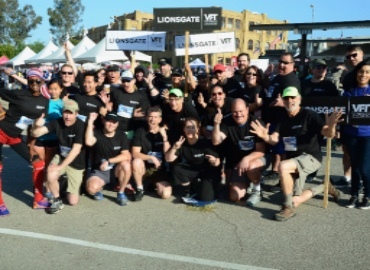 "VFT would like to thank the members of Lionsgate Vets Initiative who came out to support veterans on such an important day: Ryan Black (VP, Lionsgate), Leon Pilosof (Navy Veteran), Jim Gladstone (EVP), Daniel Greenstreet, Kazuko Golden and Susan Ehring." New Directions for Veterans is a nonprofit agency that assists homeless veterans, providing various services including permanent and transitional housing, job training, and substance abuse treatment. New Directions is currently raising funds to enable continued support to the 4000 veterans currently living in the streets of Los Angeles. 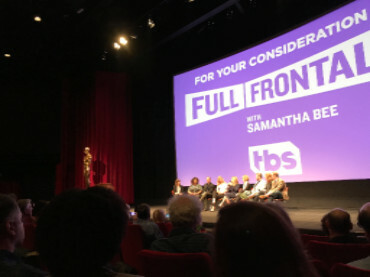 TBS hosted about 40 VFT members for a NIGHT OUT WITH SAMANTHA BEE, with a panel of correspondents and executive produces that featured Samantha Bee, Jo Miller, Miles Kahn, Ashley Nicole Black, Allana Harkin, Mike Rubens, Alison Camillo and Pat King and moderated by Carrie Browstein. SURVEY: Thank you to the over 467 VFT members who completed the "Mother of All Surveys!" You are CONTRIBUTORS. For us to thrive, we need meaningful ways of tracking information about our members and results of job, internship and casting notices that come to us. We also need positive, constructive feedback and surveys like this make the difference. Your feedback has been invaluable and insightful for the board and leadership. We are in the process of aggregating the data to share with you as we think you will find it quite illuminating as well. And congratulations to the 4 winners of the Amazon card draw! They will be anounced at the June event. AMAZON SMILE: People often ask how they can help VFT. Here is one easy way to help! Do you shop on Amazon.com? If so, shop for the same products on AmazonSmile.com, a website operated by Amazon. The difference is that when you shop on AmazonSmile, the AmazonSmile Foundation will donate a portion of the purchase of eligible products to the charitable organization of your choice, such as Veterans in Film and Television. It's that simple. Thank you again for your time and commitment to this organization. Veterans in Film & Television is a nonprofit networking organization that unites current and former members of the military working in the film and television industry.